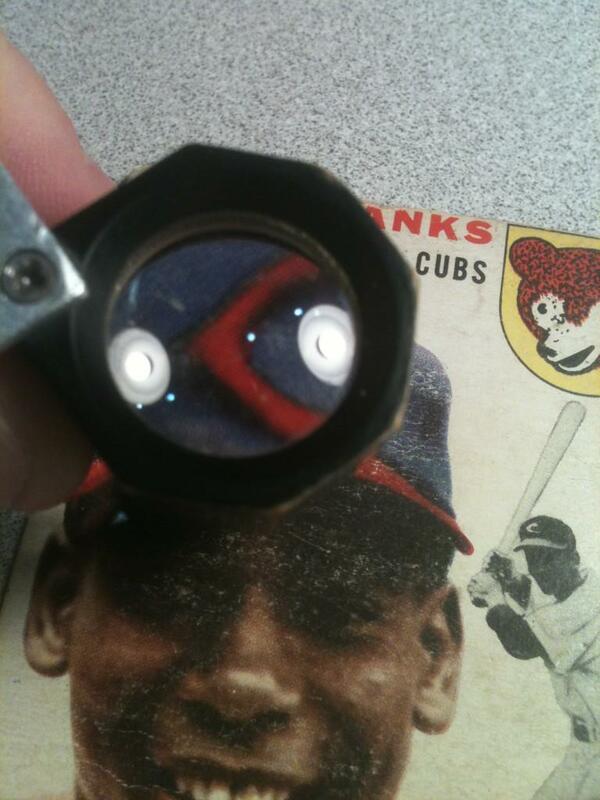 It is one of the most repeated questions from people that want to learn how to look at cards and possibly get better grades, what kind of loupe or magnifiers do you use at BGS? When you are shopping for a loupe to use for grading cards, one will find there is a sea of options and brands. I will say that I am loyal to certain brands with other products but loupes are not one of those products. What is more important is getting the right features. My main loupe that I travel to cards shows with has the right features. I can’t tell you the brand as after nearly 14 years of everyday use, any markings and logos have long since worn away. So, let’s go shopping for a loupe that is fitting for professional card grading. The first thing we are looking for is the power of magnification of the loupe. This will be designated by a number like 10X, 20X, etc. We are looking for a 10X, or 10 power magnification. This is the standard used by all professional graders of cards, coins and gemologists. Anything more is overkill. That’s not to say I don’t use stronger in certain instances. I have a 22x I use and a stereo microscope that is 40x to 60x. These are rarely used in everyday grading. The 10x will be your workhorse. This one is preference more than function but I recommend a lens with a diameter of 20mm or more. A tiny lens is harder to see through and can have more distortion. We are looking for a triplet. This means there are 3 elements in the lens, or 3 lenses that are cemented together. A triplet design is what we have to have in order to have a achromatic lens. This means a lens that is corrected to limit the effects of chromatic and spherical aberration. For the layman, that means we have a loupe that will not distort the image of the card through the lens and will not give a false color. Ever use a cheap single or doublet lens and you will see a weird bent and distorted image and a yellow/blue halo around the edge of the lens. This makes it difficult to grade a card. Makes it impossible to grade something like a diamond where color and distortion change the grade and the value. Yes there are achromatic doublet lenses, but we aren’t talking about a large amount of money to upgrade to a triplet lens. I won’t use less. I recommend a folding loupe or a loupe like a Peak brand that will come with a case. I have both but my go-to loupe is a folding loupe that has a small leather case. Find a design that suits your usage. I said before, I have no loyalty to brands when it comes to loupes (maybe a lens company wants to change that and make me a custom loupe to endorse…). I will recommend a few different good loupes in different price ranges. Expect to spend $30-$60 for the right loupe but it will last you a lifetime. My everyday loupe is over 13 years old. It has graded cards for a living everyday for those 13 years and has logged over 180,000 miles flying to card shows to grade. It’s still ticking. My opinions are based on grading cards professionally day in and day out. What is good for me may not be best for you. 2. BelOMO 10x triplet is a loupe made in Belarus. It is comparable to the Hastings and one distributor sells a package deal with both loupes. The Belomo has a larger 21mm lens. A nice option with the features you are looking for at a reasonable price. Looks and feels like that no-frills Soviet-era construction. Probably a good thing to be rugged when traveling to card shows and shops. Price: Around $30.00. 3. Peak #1983 Scale Loupe 10X is probably the Cadillac of loupes for grading. These loupes are a fixed unit, not a folding loupe. These have a much larger viewing field and they have a measurement scale inside the loupe. These will set you back in the $100.00 range but are top of the line optics from Japan. The above few loupes are in no way an exclusive list. There are so many different options, it will be easy to get overwhelmed when shopping for a loupe online. Don’t worry about brand. Shop with the criteria you need and the loupe you need will be found. Lighted loupes are a great idea in theory. We grade in a curtained off room at the booth at card shows so the lighting is poor at best. We have to have a good lamp for sure. It seems lighting at shows is never very good. Coin shows you see dealers with lamps at their table. While it is an additional expense for electricity at shows, it is nice to have if you are spending big money and really need to see the cards. My opinion on lighted loupes is there isn’t one out there yet that I like. The light stick loupes that look like a magnifier on a flashlight usually have s ingle lens that has very poor optic qualities. Unusable for card grading. Peak makes one as well but I do not like it. There is at least one company that makes folding loupes with a built in LED light. These are closer to useable but the only ones I have seen are on low quality doublet lenses. Just not quite the quality we need. When someone makes a 20mm or larger triplet achromatic lens with a built in LED light, call me. I’m a buyer and a promoter for a loupe like that. King of this tiny hill.